We showed solidarity with Palestinian prisoners on the 41st anniversary of the first Palestinian Prisoners' Day. Since 1967 about 750,000 Palestinians have been imprisoned, so that nearly all families have experienced the imprisonment of at least one male relative. UN committees have ruled the detention of Palestinian children illegal. UNICEF says Israel is the only country in the world where children are systematically tried in military courts and subjected to 'cruel, inhuman and degrading treatment or punishment.' (see panel on right). Over the past decade, Israeli forces have arrested, interrogated, and prosecuted more than 7,000 children between 12 and 17. At the end of February 2015, there were 182 Palestinian children held as 'security prisoners' in Israeli prisons. The UNICEF report found evidence of practices it said were "cruel, inhuman and degrading treatment or punishment." "Ill-treatment of Palestinian children in the Israeli military detention system appears to be widespread, systematic and institutionalised," it concluded. "In no other country are children systematically tried by juvenile military courts that, by definition, fall short of providing the necessary guarantees to ensure respect for their rights," it said. It noted that these practices violate international law. 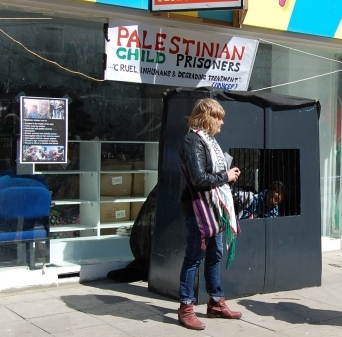 The report cited physical and verbal abuse; denial of access to food, water and toilet facilities; terrifying nighttime arrests; painful restraints; solitary confinement; coerced confessions; lack of access to lawyers and family members; shackling during court appearances; and transfer to prisons outside Palestine. 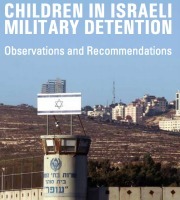 The UNICEF report "Children in Israeli Military Detention" can be downloaded here. Copyright (c) Hastings Palestine Solidarity Campaign. All rights reserved.